Hey I’m today’s stop on the blog tour for this beautiful new book! 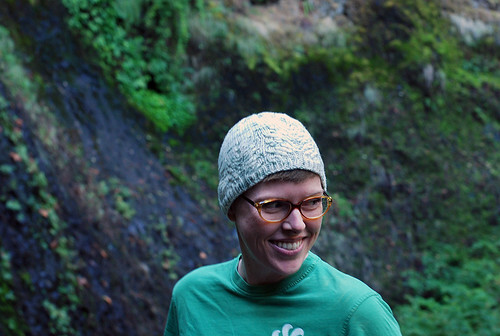 I have been excited about The Modern Natural Dyer by Kristine Vejar since I first heard about it – Kristine is the founder of A Verb for Keeping Warm, the naturally dyed yarn company and shop in Oakland. Like the shop (I had the opportunity to visit several years ago – excellent place!) 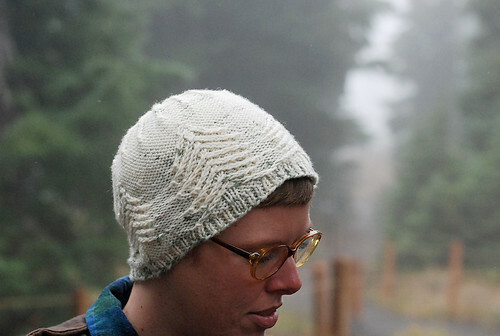 and AVFKW yarn, this new book is absolutely gorgeous! The photos of all the dye materials and hand-dyed fibers and fabrics make for a book I just want to keep flipping through for the visuals, and then it’s of course packed with all the info you need to know to start natural dyeing. Every type of dye material gets a photo spread showing what it looks like, and what colors you’ll get on different kinds of fibers – so many awesome colors you can get out of nature, especially in the yellow-orange range, which you know I love!! I took a natural dyeing class with Kristine a few years back – a short lecture intro class – and basically came away feeling overwhelmed and like I probably wouldn’t find the time or motivation to take the next step and actually try anything I learned about. But this book gives me new inspiration, and a new feeling that I CAN manage to take that step, now that it’s all broken down in so much detail for me here. Not only did I receive a review copy of the book, Kristine was super generous and sent me a dye kit as well! I chose the indigo kit because I am totally in love with all the indigo projects in the book – the A Verb For Keeping Warm website has this kit and three others: dye with flowers, madder, weld, logwood, or cochineal. All the kits are for specific projects in the book, so they include not just the dye materials but also the items to dye, and anything else you need, like thread, to complete the project. The indigo kit I got is for the Waves Bandana project, so it includes two white bandanas for me to dye – a perfect way to try out indigo dyeing for the first time before I use it on something bigger. The bandana project is an introduction to bound resist dyeing – the fabric is wrapped, or bound, so the dye doesn’t touch certain places. I love how the bound fabric looks as it’s being dyed! Pretty much everything I need is there in the jar. The kit should be enough for me to dye several medium sized items, so I’ll be pulling a few things from my closet to dip in there after the bandanas! Indigo can be used on both cellulose-based and protein-based fibers, but they react differently, and it seems fabrics like cotton and linen are an especially good fit. I have a plain cotton dress that might be the perfect thing! The book includes many different kinds of indigo projects – it teaches using indigo with different types of fabrics/fibers, dyeing with other natural dyes along with the indigo to get different colors, creating variegated yarn, bound resist dyeing, pole wrapping (that is a COOL looking technique! ), stitch resist dyeing, and folding & clamping. Okay so here’s the best part of this blog post: giveaway! One very lucky reader will receive the book and one of the kits of your choice!! To enter the giveaway, leave a comment here saying what item you’d love to natural dye (it could be an item of clothing you already own, a skein of yarn to knit into a shawl, some linen fabric to sew into a shirt, etc). I’ll do a random drawing a week from today, Wednesday November 4th, and I’ll reply to the winner’s comment. Make sure you receive replies to blog comments in your email inbox, or check back here next week to see if you won! Update 11/4: Giveaway is now over – congrats to commenter fasdy on her win!! 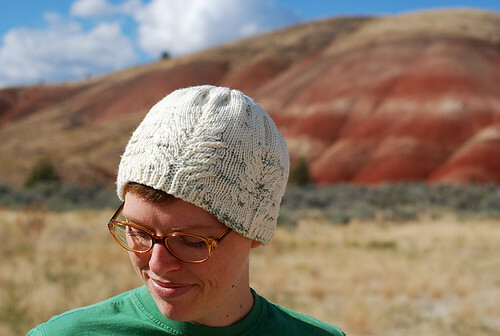 You can find the book and the awesome kits all for sale on A Verb for Keeping Warm’s website here! If you want to see lots more peeks into the book, and at different kits and projects, follow the rest of the posts in the blog tour! 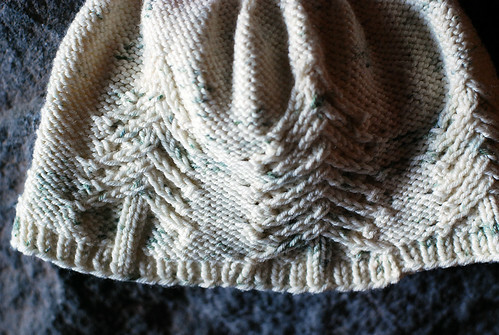 It features a twisted stitch trees design (3 different trees), which happens to be reversible! 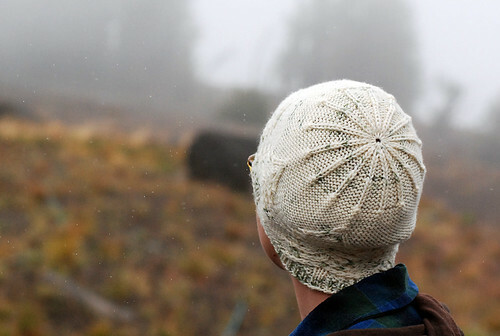 I was given this Snowy colorway yarn by Knitted Wit, a worsted weight white base with speckles of forest green, and of course my mind went straight to the fir tree filled forests of this beautiful state where I live. But wait, there’s more! 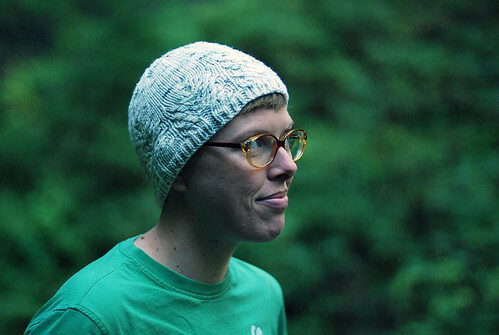 5 other Portland designers were also given these yarns in the new Snowy colorways, a different color for each designer, to use for new hat designs. The result is the Snowy Hat Collection! 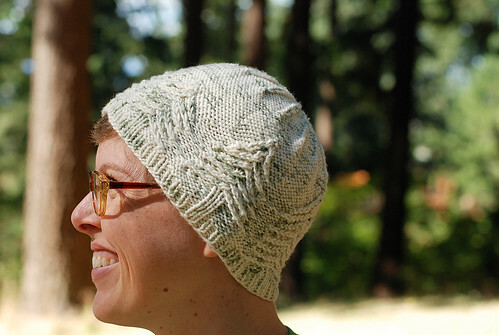 Through December 31, 2015, you can get the 6-pattern eBook for $15 (on ravelry here), and Knitted Wit has kits on her website, while supplies last only! 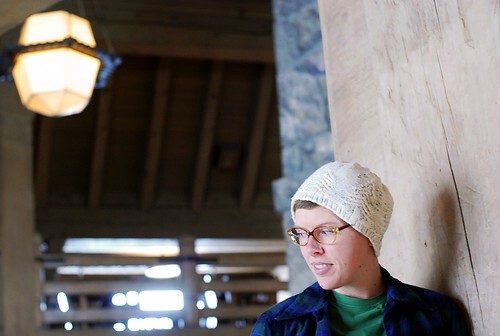 The kits include: a skein of the yarn in Targhee Shimmer Worsted or Worsted Super Wash Merino, your choice of base and Snowy colorway, the ebook, plus a custom JaMpdx Snowy mug and tea tasting from Happy Rock Coffee. 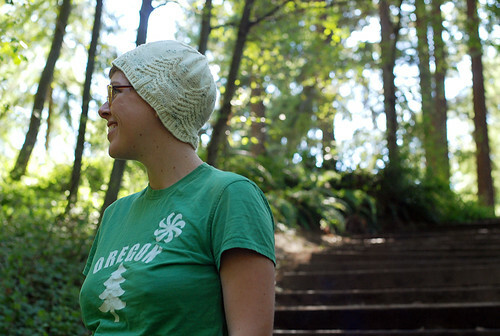 AND, 10% of all proceeds from the kits, the ebook, and all the individual patterns, will be donated to Raphael House of Portland, a domestic violence agency committed to engaging our entire community in non-violent living through advocacy, education, and community outreach, and by providing a safe haven from domestic violence. The other rad designers are: Star Athena, Shannon Squire, Michele Bernstein, Debbi Stone, and Katherine Leek (links are to the ravelry pages of the hat designs). 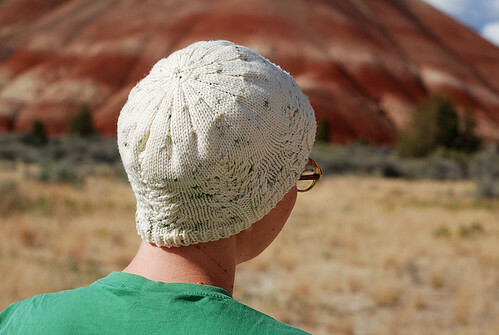 There’s a really nice variety of hats – this would be an excellent collection for holiday gift knitting! So now, my design… there are the trees on the body, and the crown is a big starburst kind of design. The hat can be more fitted to the head, or more loose – there are 4 sizes, and height can easily be added if you want it taller/slouchier. Pictured above is the medium size, which fits perfectly on my 22 inch head, and below is the extra large size, for a loose fit on me. The extra large sample is in the Targhee Shimmer Worsted yarn, which is 80% superwash Targhee wool, 20% silk (I LOVE it), and the medium sample is in the Worsted Super Wash Merino (medium is below). 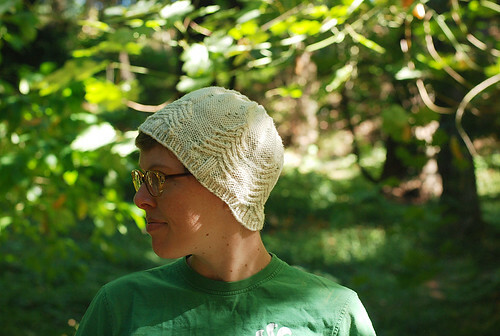 And then my third sample, pictured below, is the small size, which does fit me but it’s a bit tighter than I’d like, best fit to a head around 20-21 inches – this one is also in the Targhee Shimmer. 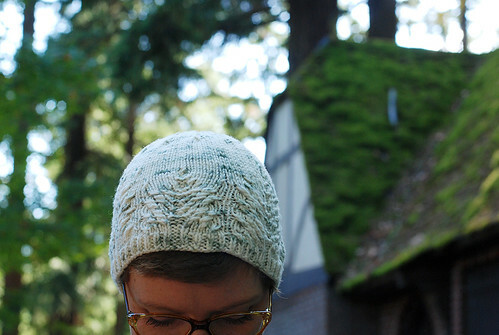 Many thanks to my sample knitter friend Revi for knitting up this sample!! 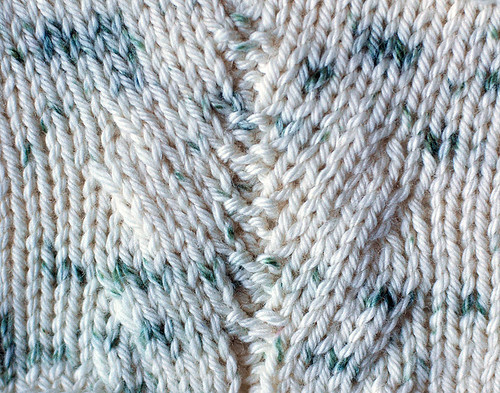 The recommended method for the twisted stitches, the way I show on my tutorial page here, which makes twists over 2 back stitches by twisting all 3 stitches around each other, is what creates that pattern on the reverse. If you instead work the over-2 twists like cables (the back 2 stitches staying oriented the same way, as a normal cable twist), then the reverse side will look how you see below, which you may like better! 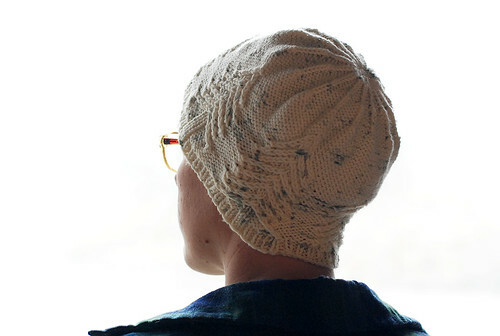 So that gives you another modification option – one of my test knitters made her hat this way because she preferred it. Looks good! Hey are you liking my photos?! 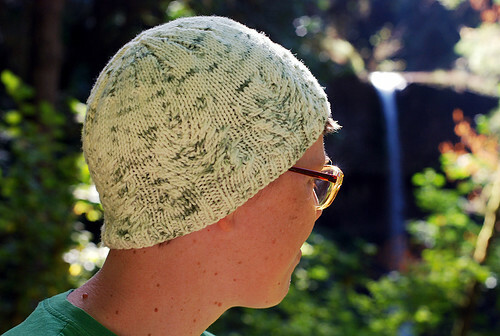 We went a bit crazy with photos for this pattern, because we went on a few end-of-summer day trips and brought the hats and camera along! Good timing! When I say “we” I mean my husband and I – so many thanks to Pete for being my patient photographer!! A few weeks ago, we took a trip to central Oregon, driving through Mount Hood on the way out, with a stop at Timberline Lodge (aka the Overlook Hotel!) – the above shot was inside Timberline. It was crazy foggy that morning, like we were inside a cloud! 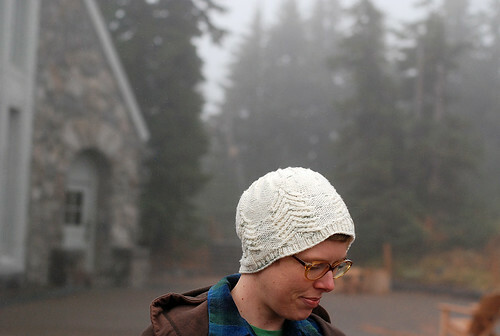 And the misty air made some of the photos almost look like it was snowing, which is great! 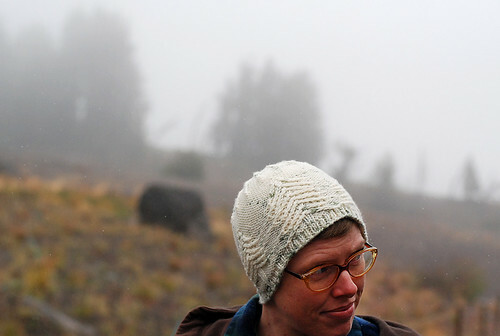 Also, I was FREEZING during this outdoor shoot – it was going to be a super warm day, and the layers I had with me were not adequate for the mountaintop inside a cloud. But we still got some great shots up there! Different angles outside the lodge – the above and below shots were like 30 feet away from each other, facing different directions. 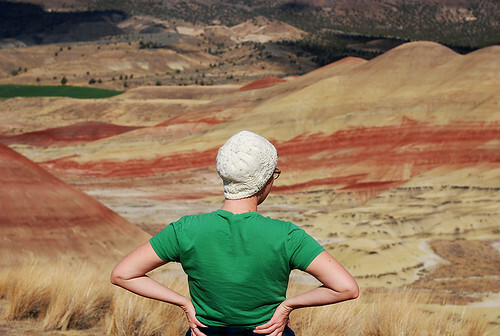 Then we headed out to central Oregon, to the Painted Hills! We’d never been before, it was pretty incredible! 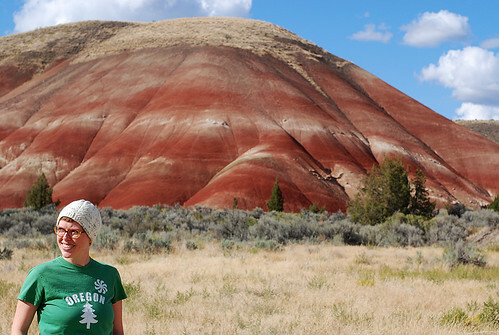 These Painted Hills shots don’t really fit the forest theme of the hat, so I didn’t use any in the pattern pdf, but I like how all the photos represent a variety of Oregon nature, and the hat was inspired by Oregon nature. 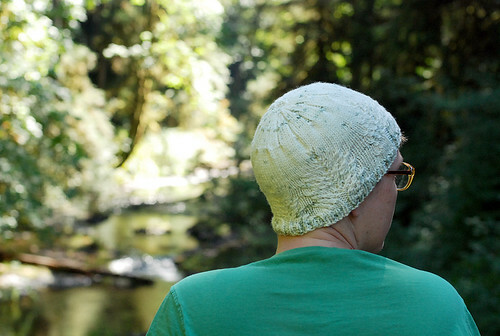 So then a few weeks later, we took a day trip out to Silver Falls State Park to hike and take more shots. Unfortunately, it was a bad time of year (and a bad year, I think) for waterfalls – the above shot is in front of where there should be a waterfall, and the blurry fall in the background below is the biggest one on the hike we took, which sometimes looks like this. That wasn’t a surprise though, we knew the waterfalls wouldn’t be major at the very beginning of fall. So we searched for good lighting (this hat was especially hard to light!) 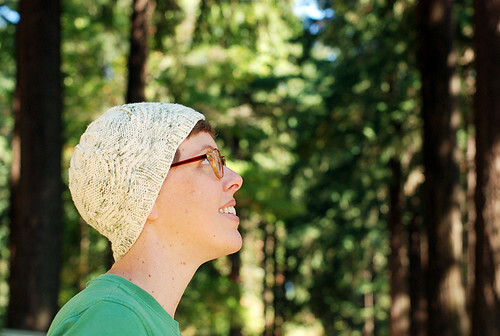 and snapped some shots, and hiked through the forest… and then I was stung by bees! Twice! I’d never been stung before and it was shocking and painful, and kind of threw off our whole hike and photoshoot game. I was a little worried and not feeling super smiley anymore… so we cut the hike short for the day. 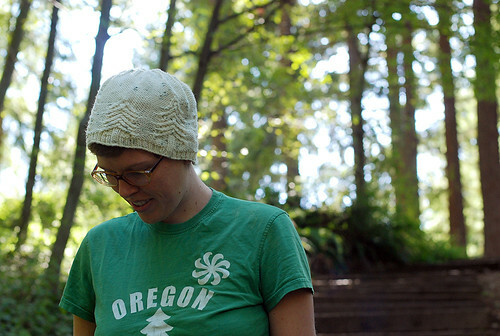 So to fill in the gaps and get all the shots I needed, we went for a walk at Mt Tabor last weekend. Lots of Douglas Fir tree backgrounds there! 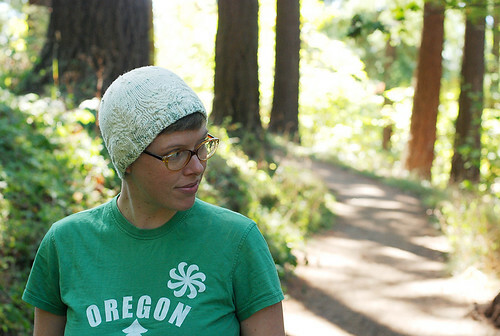 Of course, I wore my Oregon t-shirt as a uniform for all these shoots, and the same glasses, so they’d all look cohesive, but now you know the truth that there were 3 different days of photoshoots! 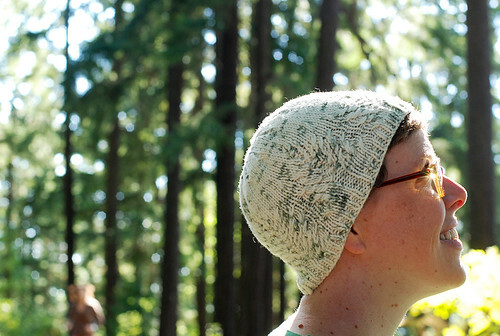 Lots of great shots at Mt Tabor! 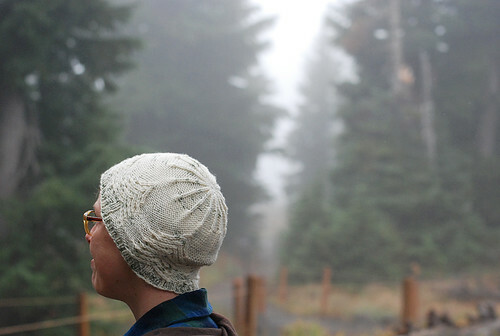 Thanks Oregon, and Douglas Fir trees, for the hat design inspiration! 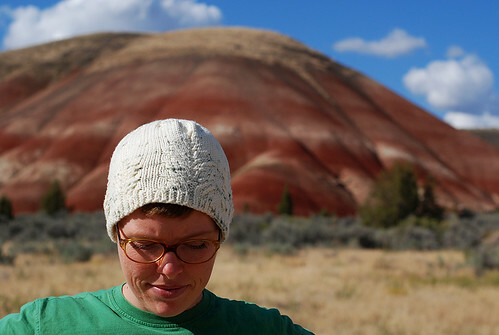 Many thanks to my excellent test knitters for whipping up hats in different sizes and kinds of yarn and stuff – check out their projects on ravelry! So that’s Siskiyou! 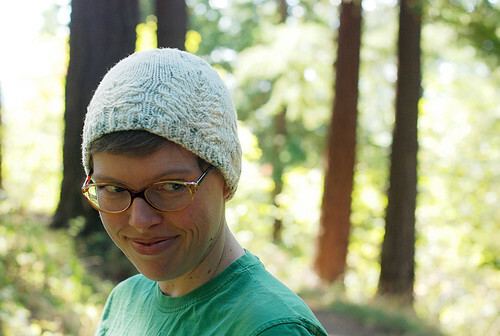 It’s fun to knit, worsted weight makes it fairly quick, and it’s cozy to wear! 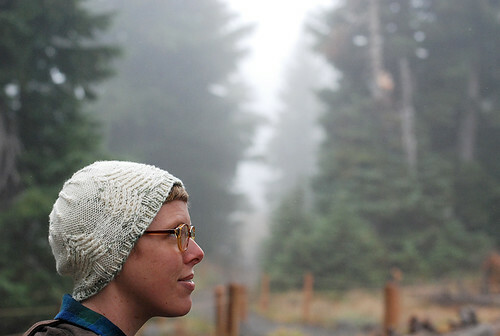 Happy fall weather knitting, all!